Fang Yuan, an accordion virtuoso from China, was a member of the China Musician's Association, a standing director of the China Accordion Society and the Vice-President of the Shanghai Accordion Association, and a soloist with the Shanghai Philharmonic Orchestra. In 1984, she left China to settle in Singapore. Fang Yuan began piano study at six and was admitted to the Shanghai Conservatory of Music as a piano major at 12. A product of intense professional training, she has always excelled. After graduation, she developed a keen interest in the accordion. 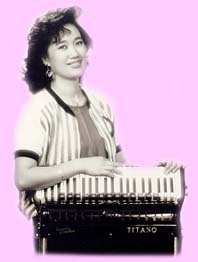 Her solid piano background coupled with her fine musical accomplishments and hard work, enabled her to master accordion performance technique very quickly. In 1973 she joined the Shanghai Philharmonic Orchestra and was outstanding in the Shanghai Youth Performances which launched her meteoric career as a soloist. Fang Yuan has performed in more than 40 cities throughout China. 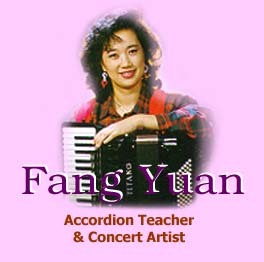 After she left China, she became an international concert accordionist and appeared in many major international accordion events in New Zealand, U.K, France, Italy, Germany and USA, such as the Coupe Mondiale Competition, the Grand Prix, the AAA and ATG competitions and the Premio International Citta di Castelfidardo… Apart from her concert activities, she was invited as a jury either in China or West countries. She was always greeted with a warm welcome and high acclaims everywhere she visited. She performed on radio and television very often and gave masterclasses and seminars as well. Her performance were made records and cassettes. Her music arrangements were published in China and the States.